Registration Checklist- Checklist to assist in registration process. Required TGHSLL Code of Conduct *- TGHSLL rules of conduct and agreement. SGLC Policy Manual *- Club policy manual of rules. Athlete's Plate *- What an ideal plate looks like for athletes at meal time! Eating for Recovery *- What to eat after exercising. In other words, how to recover after exercise and replace what we have lost! Hydration *- It is important to stay properly hydrated. Sweat losses are great during exercise, even more so in hot conditions. When fluid balance is achieved, performance will be at its best. Iron Rich *- Getting enough iron in the diet is very important for athletes, but that can be tough for youth athletes, endurance athletes, female athletes, and vegetarian athletes. Iron is important for helping athletes transport oxygen to our muscles throughout the body. This document has list of iron rich foods. Snacks *- With our busy schedules, it can be tough to snack throughout the day. This contains list of snacks that can help athletes frequently fuel up to help keep muscles stockpiled for instant energy. 01 - SGL Parent Rules Session- Basic rules session presented by Coach Elmore for parents at Parent Rules Session dinner 10/25/18. (please note that the two embedded videos may not work in your download due to technical limitations). 02 - WLAX Field Diagram *- Detailed diagram of the women's lacrosse field showing the names of the lines as well as the dimensions. 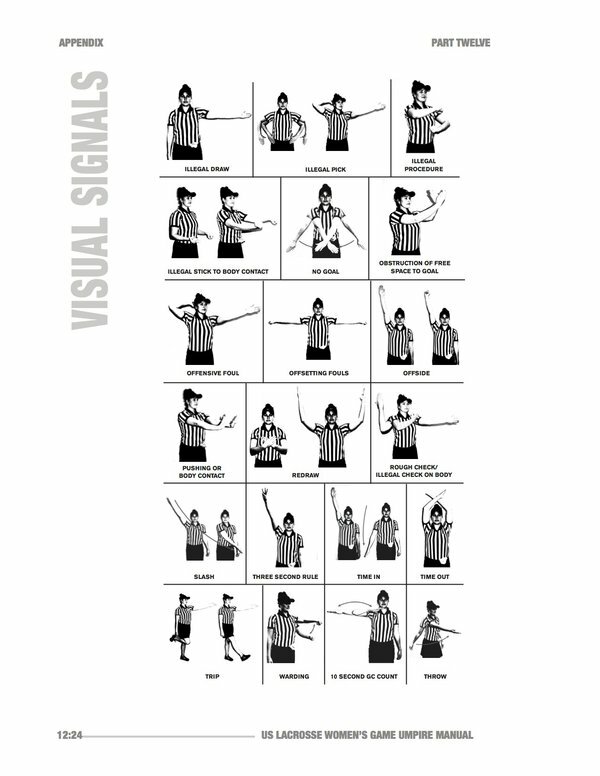 03 - WLAX Motion Offense *- Describes the basic "motion offense" in women's lacrosse. 04 - Defense *- Covers basic concepts of settled defense in the critical scoring area. 05 - Game Timing *- How the game clock works in women's lacrosse. As important reference for those running the clock during home games. 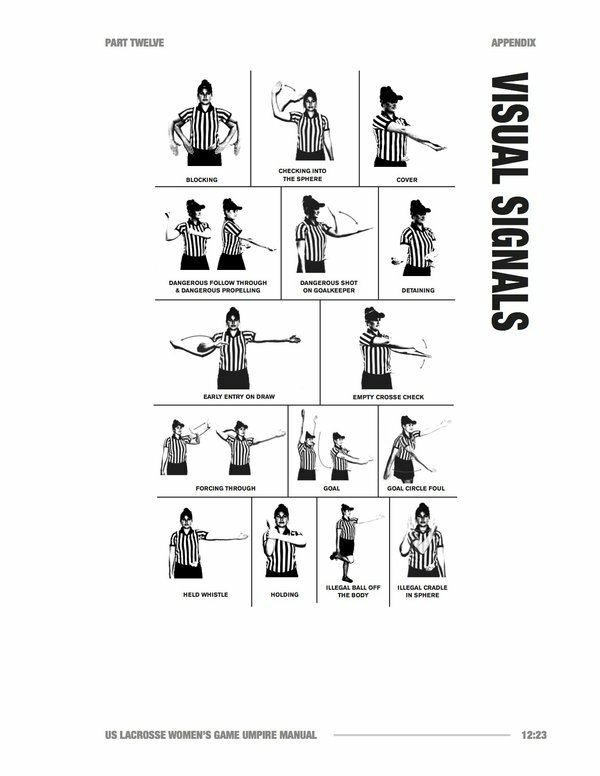 07 - Official's Signals, Page 2- Second page of signals that officials might use in a game. Again, just for knowing what is going on; not to be used to yell at officials! 10 - 3 Seconds Violation *- Detailed description of the 3 seconds rule as well as examples of when it should and should not be called (excerpted from both the rule book and the officials handbook). 11 - Free Space/Shooting Space *- Detailed description of the free space/shooting space rule as well as scenarios demonstrating when it should and should not be called (excerpted from both the rule book and the officials handbook). 2011 Womens Statics Guide *- This is from the US Lacrosse website but it is not clear who authored it. It appears consistent with the NCAA guidelines and both should be reviewed together to ensure a complete understanding of how the stats should be applied. Monday Sports Injury Clinic at Texas Children's Hospital West Ca *- The Monday Sports Injury Clinic at Texas Children's Hospital West Campus was created for youth athletes who have sustained injuries from athletic events.